We´ve all had to swiftly run round our cars to dry them before water spots form, which are very hard to remove and can badly affect paintwork. And try as you might, washing and drying will cause swirl marks and light surface scratching. Existing in-line water filters are either very expensive or have incredibly short lives, and can waste the casing, which is very environmentally unfriendly. For example, the AquaGleem filter is 2.5 litre capacity, typically retails at £55. That´s 54% more expensive than our unit costing you 38p per litre. The Race Glaze unit costs 25p per litre, as supplied with its first fill of mineral-absorbing resin,and only 10p per litre with subsequent refills ! 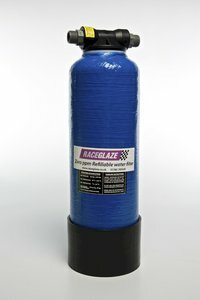 The new Race Glaze Maxi-Filter uses a durable fibreglass tank ready filled with premium A1 grade resin (note: some budget filters use sharps - broken reject resin) and comes ready for you to add standard Hozelock-type connectors to begin use immediately. The tank is pressure tested and certified to 11 bar. Tap water enters the tank and under mains pressure is forced up through the resin bed to emerge on the outlet side as close to 0 parts per million (ppm) of dissolved solids as possible. You can use a pressure washer or just mains pressure, with no degradation of water pressure at the delivery end. And no need to empty when you have finished your wash, just turn off the mains. Using a hosepipe to wash a car uses approx. 30 litres of water (AutoExpress 21/3/2012), a final rinse only a fraction of that - we estimate 5-7 litres at most. This is a breakthrough in filtered water product for car washing that is sure to be very popular. AutoExpress regarded it very highly and featured it as one of their 'Products of the Year' in December 2013. Accessories: Water Hardness Meter so you can test the water to see when resin needs replacing, and replacement resin in 7 litre or 25 litre bags. Bought this item last year, along with a spare bag of the filtration granules. This is not a product that I would have bought due to the cost however after reading the reviews I thought I would bite the bullet. I have used this item on my 911 about 10+ times and the results are very good. There is still a need to have a leather handy as you will still have droplets of water on the car, however it really does take the hassle out of the clean and can be done in less than 5 minutes, once you have rinsed the foam/suds off. Easy to set up. I have not used the new bag as yet but signs are I may need to soon.